The Association for Nonsmokers-Minnesota (ANSR) conducts research on tobacco industry web and mail marketing with funding from ClearWay MinnesotaSM. The project began in 2010. Today, the ANSR archive contains thousands of examples of marketing. The tobacco industry uses these types of marketing to build relationships with consumers. Tobacco companies frequently send free giveaways to consumers on company mailing lists. These items help increase customer loyalty and brand awareness. Here are two recent examples of free giveaway items. First, the e-cigarette company blu gave away a set of darts. These darts were “purchased” with points that were earned by completing activities on the blu website. 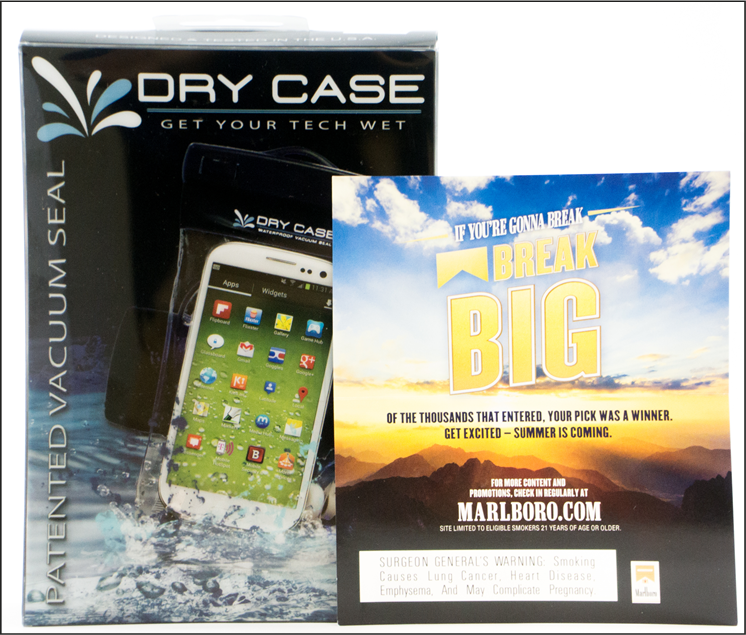 Second, Marlboro gave away this “dry bag” for a phone or iPod as a prize for playing a game on the company’s website.